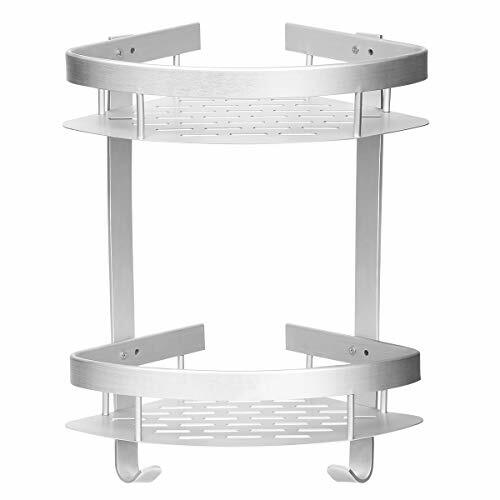 HOMEIDEAS 2 Tiers Corner Adhesive Shelf Keep your bathroom neat and Beautiful!!! Two shelves could store soap, body wash, shampoo, conditioner and other necessities, two hooks on the bottom which can be used for hanging a loofah sponge, washcloth or exfoliating brush. These shelf save you space on floors, counters, desks, cabinets and more. You could use the adhesive, also could use the hardware. 1 .Open the package and assemble the shelf with screws. 2.Clean the wall and make it dry. 3.Put the shelf on the wall to measure where you should install, and Use a pencil to mark the adhesives position. 4.Tear off the cover of adhesives , stick top 2 first, and then others. Pressing hard on the dhesives ensure the removing all bubble. 5.Let the adhesives dry for 24 hours and put the shelf on them and you could use the shelf. 1.Please DON'T stick the shelf on painted walls or wallpapers. 3.Make sure that paste does not paste on tile gaps when installing, and it not suitable ceramic tiles smaller than 4x4 inches. No Drilling: Just peel off the cover to adhesive hooks, easy stick on smooth hard walls, no damage to your wall. Powerful adhesive hooks: HOMEIDEAS powerful adhesive hooks make sure each adhesive hooks could bearing 6 lbs and we offer 8 adhesive hooks to you. Rust Resistant: Constructed with Space Aluminum, resists daily scratches, corrosion and tarnishing, Never Rust and ensuring beauty, quality and longevity. Easy Install: install it in any smooth surface. (please make sure there is no gap beneath adhesive suction sticker while install this shelf) not suitable for small ceramic tiles, at least 4x4 inches,and waiting for 24 hours before using. Saving Space: Widely used in Bathroom, Toilet and Kitchen, great to holds cleaning supplies, such as soap, shower gel, shampoo. Any question, please contact us constomer service.